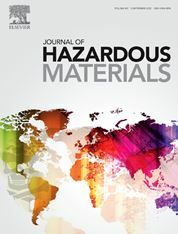 The Journal of Hazardous Materials publishes full-length research papers, review articles, and case studies that improve our understanding of the hazards and risks that certain materials pose to public health and the environment. Papers that deal with ways of controlling and mitigating risks of hazardous materials (HM) are within the scope of the journal. However, the following areas are excluded: non-hazardous materials, work place health & safety, standard municipal waste and wastewater treatment processes including nutrient removal, greenhouse gas mitigation, toxicology of hazardous materials below the organism level (i.e. at the cellular, metabolic, or molecular level), and the manufacturing of explosives. Do not focus on the environmental relevance and significance of the studied systems or materials. A 100 word (maximum) "statement of novelty" explaining why the work should be published in Journal of Hazardous Materials must be provided as a separate document upon submission of your manuscript. The "statement of novelty" must not be a retelling of the abstract. When preparing the statement, please make sure to address (a) the signficance and novelty of the work, with respect to existing literature, and (b) the scientific impact and interests to our readership. Papers that lack significant novelty will be rejected. Full-length research papers within the above stated Aims and Scope are welcome. Such contributions are not to be submitted in two parts (i.e. Part I and Part II) - these must be consolidated into one manuscript. Short communications are not considered. The Editors welcome proposals for review articles. Proposals must contain the following components for consideration: (1) a brief summary of the proposed review article content, (2) a clear indication of the novelty and urgency of such a review paper at this time, in light of other review articles on the same topic, (3) a brief description of the authors' academic background and research areas, and (4) a list of all authors' publications related to the proposed review article topic. Please send your proposals to one of the Editors directly using the e-mail addresses available on the Journal homepage: http://www.elsevier.com/locate/hazmat. Note the submission of review articles is by invitation only, pending approval of the proposal by the Editors. Letters to the Editor will undergo review. Any Letters to the Editor received will be circulated to all Editors before a decision is made whether to publish. Authors of earlier papers, if the Letter concerns a prior publication, will also be given an opportunity to respond. To ensure conciseness, follow these maximum word count guidelines: research paper: 5,000 words; review article: 15,000 words. Cover letters must state the manuscript word count, which includes text, figure captions, and table legends, but not references.